The earliest origins of the BLT are unclear, but it is believed to be a descendant of a Victorian-era tea sandwich. In spite of its simple ingredients, this sandwich is moderately high in calories and fat. BLT stands for bacon, lettuce and tomato -- the main components of this sandwich. Typically, lettuce, sliced tomato and two or three slices of bacon are stacked on two slices of toast and topped with a dollop of mayonnaise. A BLT sandwich made with two slices of wheat bread, 3 slices of bacon and 1 tbsp. of mayonnaise contains 364 calories, according to the U.S. Department of Agriculture. Bacon is high in protein, and lettuce and tomato and whole wheat bread add fiber, vitamins and minerals to a BLT. However, this sandwich contains 22 grams of fat, including 5 grams of saturated fat, and is high in sodium. 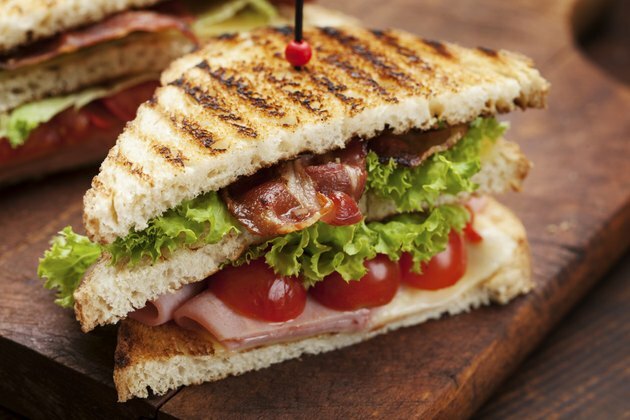 Replacing regular bacon with turkey bacon will cut 69 calories from your sandwich. Cutting the mayonnaise by half will cut 50 calories and using reduced calorie bread will cut 31.